Select Remove From Project from the pop-up menu. Do NOT hit the Delete key or select Delete from the pop-up menu! Using the Delete key or selecting Delete from the right-click menu will PERMANENTLY delete a file from your hard drive. Removing a file (or folder) from a project in MPLAB X is very different from MPLAB 8. 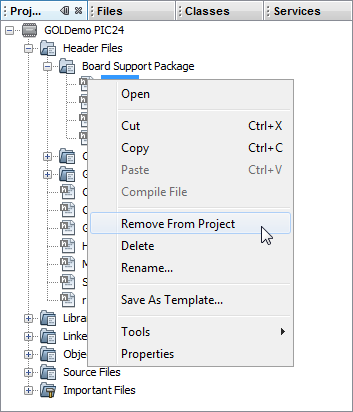 If you select a file in the project tree and hit the Delete key or you right click on a file and select Delete from the popup menu, not only will your file be removed from your project, but it will also be deleted from your hard drive without any means of recovery. The file is not simply moved to the trash, but completely deleted from the system.